Up- and down-conversion nanoparticles are inorganic nanocrystals capable of converting near-infrared radiation to emission with large Stokes and/or anti-stokes shift. The upconversion photoluminescence mechanism includes the sequential absorption of several excitation photons through the long lifetime and ladder-like energy levels of trivalent lanthanide ions (ytterbium, erbium or thulium) embedded in an inorganic host matrix. The most efficient host matrix of UCNPs is NaYF4 codoped with Yb3+, as a sensitizer, and Er3+ or Tm3+, as an activator. 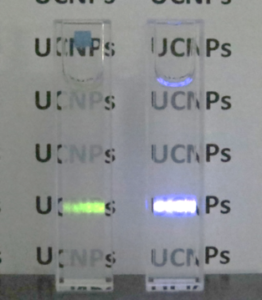 The luminescence of Lanthanide-doped nanoparticles is very stable without photobleaching and photoblinking issues. The overwhelming majority of the conversion nanoparticles prominent applications have originated from their unique luminescent properties. Today inorganic up- and down-conversion nanoparticles attract the interest in numerous fields, such as biomedical imaging, therapy agents, anti-counterfeit labels, 3D printing, information technology, solar cells, et al.